Samford University’s Ida V. Moffett School of Nursing has received Sight Savers America’s inaugural KidCheck Plus Nursing School of the Year Award. Samford nursing students partner with KidCheck Plus, a school-based health screening program, to provide head to toe screenings for PreK-12th grade students in rural and urban Alabama. Samford is one of the program’s 20 nursing school partners in Alabama. Nursing school dean Eleanor V. Howell, associate dean Joy Whatley and nursing faculty member and partnership manager Elaine Marshall accepted the award during an Aug. 26 presentation ceremony at Samford. Nichols noted that Ida V. Moffett School of Nursing was selected for this honor based on its superior communication and partnership with their program; faculty leadership that encourages a positive work effort and inspires a spirit of service; outstanding involvement with the program and a willingness to participate when possible; and exceptional organization and dependability at their KidCheck Plus health screening events. According to Marshall, students gain a greater understanding of the health challenges facing underserved communities by working with the KidCheck Plus program. 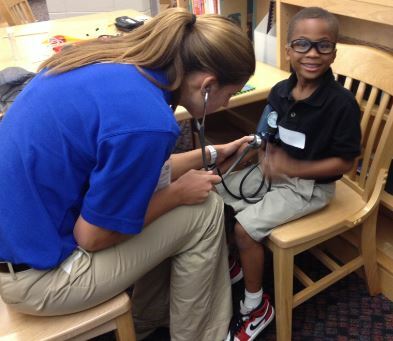 In 2013-14, Samford nursing students provided 1,832 health screenings at nine schools. A number of issues were identified, leading to nearly 700 referrals. Following each screening, reports were sent home to parents and provided to each school’s nurse. “The Sight Savers America KidCheck Plus program delivers a win/win for children, schools, nursing students, colleges and universities and our communities,” added Nichols. More than 20,000 children are screened through KidCheck Plus each year and of the children screened, approximately 50 percent have identifiable health needs. Ida V. Moffett School of Nursing has partnered with the program for two years and will continue its involvement in 2014-15.